The 13VM1040ASIR is very similar to the 13VM550ASII. It features a similar focal range and an identical F-value. 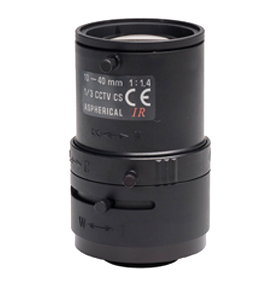 Additionally, the special glass materials applied in this lens make sure that IR light of up to 1000nm is refracted in the same focal plane as visible light. The image will not defocus with the use of IR-Illuminators and a special coating ensures a high transmission of IR – light. The 13VM1040ASIR is the telephoto-version of our IR-corrected lens series and most suitable for outdoor surveillance applications.